All St Anthony’s uniform requirements can be purchased from St Ursula’s College Retail Outlet (uniform shop). Cnr. Warra and Rome Streets Toowoomba. Some Second hand items are also available. For enquiries please phone Ms Terre Hawkins (07) 4638 8715. Opening times during January are extended. Please contact 4638 8715 for details. The school hat must be worn at playtime and while waiting for the bus. It is expected to be worn, where practical, for other outdoor activities. The school observes a ‘no hat – no play’ rule whereby students identified without their hat outside, must sit in the shade during playtime. 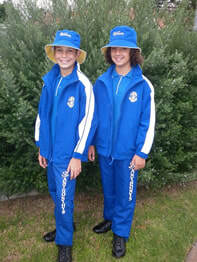 The official broad brimmed blue school hat with logo is to be worn with the regular day uniform. The sports house bucket hat is only to be worn with the sports uniform. These hats are available at ‘St Ursula’s Uniform Shop’. Caps are not permitted. Black (all over colour) leather school shoes/sports shoes. No boots. For games that require specialist footwear for training/games, the students need to bring footwear and change prior to the event. The royal blue pullover with blue stripes and embroidered school logo is available from ‘St Ursula’s Uniform Shop’. It may be worn to complement both the winter and summer uniform. The blue (with white sections and school logo) tracksuit is worn on sports days, particularly in winter. Pants and jackets can be purchased together or separately. They are available from ‘St Ursula’s Uniform Shop’. The uniform consists of a ‘Princess’ style royal blue tunic with embroidered school logo and long-sleeved blouse in school blue colour, school tie and knee high grey socks with blue stripes. An alternative to socks are grey opaque tights. Black leather shoes are worn with this uniform. This uniform is worn for the colder months and on special occasions. Students will be notified of these occasions. These uniforms are available from ‘St Ursula’s Uniform Shop’. The winter uniform consists of grey trousers with St Anthony’s embroidered above the back pocket, a long sleeved school blue shirt with embroidered school logo, school tie, St Anthony’s knee high socks with blue stripes and black leather shoes. This uniform is worn for the colder months and on special occasions. Students will be notified of these occasions. These uniforms are available from ‘St Ursula’s Uniform Shop’. Girls wear a ‘Presentation Schools’ dress – blue checked with Madonna blue trim, St Anthony’s embroidered on the collar and short tie, grey turn about socks with blue trim and black leather school shoes. The alternative uniform is a blue checked blouse with Madonna blue trim, St Anthony’s embroidered on the collar and short tie. This is worn with a Royal blue skort printed with the school logo. These uniforms are available from ‘St Ursula’s Uniform Shop’. Boys wear a short-sleeved school-blue embroidered shirt, grey shorts with St Anthony’s embroidered above the back pocket accompanied with St Anthony’s School grey knee high socks with blue stripes and black leather school shoes. These uniform items are available from ‘St Ursula’s Uniform Shop’. Prep students only wear the school sports polo shirt and blue school shorts with blue sports socks (with two white stripes) and black joggers. The tracksuit may also be worn during colder months. The socks, polo shirt, shorts and tracksuits are available at ‘St Ursula’s Uniform Shop’. Royal blue shorts with two pockets with printed school logo. Girls have the option of wearing a skort. Both boys and girls uniforms are accompanied by a royal blue polo shirt with printed school logo. The sports uniform is complemented by sort royal blue socks with two white stripes. The shorts, skort, polo shirts and socks are available from ‘St Ursula’s Uniform Shop’. Scarves and Beanies are an optional item but if you choose to wear them they must be the approved school item. As of 2015 ALL Prep and New students must have the St Anthony’s School backpack. All current students are to replace their existing schoolbag with the St Anthony’s Backpack only when their current bag needs replacing. Hair must be worn in a clean and tidy fashion. Longer hair should be pulled away from the face and secured with a blue ribbon or scrunchie. Hair colourants should not be used. Styles should be conservative in nature and tracks, rat-tails, undercuts and ‘number one’ cuts are not permitted. If your child presents with any styles mentioned above, parents will be called to have the child’s hair style altered to fit within the guidelines. All hair accessories, scrunchies, hair bands, ribbons, etc. are to be royal blue or in school uniform check. Decorative combs, coloured head bands and other coloured hair accessories are not permitted. Students may wear simple, unobtrusive watches. Girls with pierced ears may wear one simple gold or silver stud or sleeper in each ear. Decorative jewellery including Euro balls are not permitted. A signet ring may be worn. Only small, simple necklaces of a religious significance may be worn. Coloured plastic armbands, plaited wristbands or other wrist jewellery is not permitted. If your child wears ear-rings they must wear them in both ears. Students must not wear coloured nail polish to school. School Badges may be purchased from the school office at $4.50 each. The school badge can be worn on the tie as part of the winter uniform. As part of the summer uniform, it can be worn on the left collar.